Our Artist's Hand Soap Sampler is the perfect gift for artists! Formulated to moisturize artists' hands, this artist's gift sampler contains eight 1.5 ounce slices, one of our Shea and Cocoa Butter Hand Repair soap fragrances: Herbal, Bay Rum, Jasmine, Lavender, White Spice, Green Tea, Patchouli and Bergamot Mint. Each slice is individually labeled and wrapped so you, or whomever will receive your gift, will know exactly 'which soap is which'. Minimum weight is 12 ounces, equivalent to approximately four bars of bath size soap. 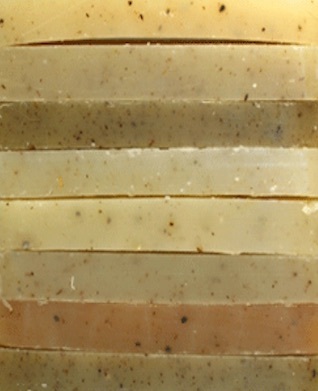 Soaps in this Sampler include Olive, Coconut, Castor and sustainably harvested Palm Oils, Shea Butter, Cocoa Butter, Sodium Hydroxide (Lye), Mountain Spring Water, ground medicinal herbs, cornmeal grits, essential oils and fragrances.